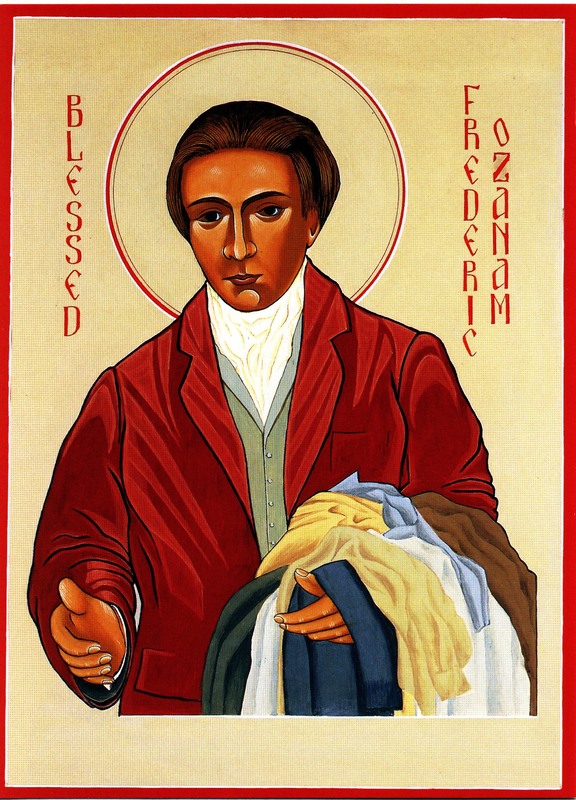 Sep 8 – Blessed Frederick Ozanam (1813-1853), Husband, Father, Founder of the St Vincent de Paul Society | ADULT CATECHESIS & CHRISTIAN RELIGIOUS LITERACY IN THE ROMAN CATHOLIC TRADITION: hosting ONLY True Christians!! !, or "How to think Catholic!!" Also, classes begin this week at DePaul. And so, it is almost spooky we celebrate the Feast of Blessed Frederick Ozanam this week. Please pray for my students. Please pray for me. Please pray I may be faithful in my teaching and be an example of Vincentian “service to others” as St Vincent DePaul & St Louise de Marillac would have me teach and be. Please pray my students take more away from their time spent with me than mere technical skill. St Vincent DePaul & St Louise de Marillac, pray for me! 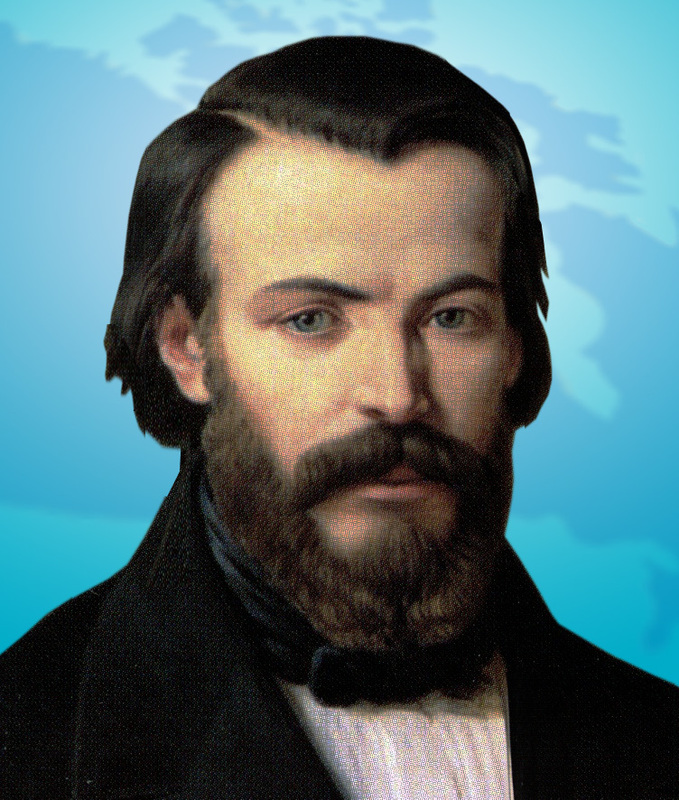 Frederic Ozanam lived a short life in one of the most tumultuous periods of history. Born in the year of Napoleon’s defeat at the Battle of Leipzig, Ozanam would witness two major political upheavals in France during his lifetime–The overthrow of the Bourbon Dynasty in the 1830 July Revolution and the end of Louis Philipp’s “Bourgeois Monarchy” during the 1848 Revolutions. By the time of his death forty years later, France was once again an empire and once again ruled by a Napoleon. Frederick Ozanam was a man convinced of the inestimable worth of each human being. Frederick served the poor of Paris well and drew others into serving the poor of the world. Through the St. Vincent de Paul Society, his work continues to the present day. 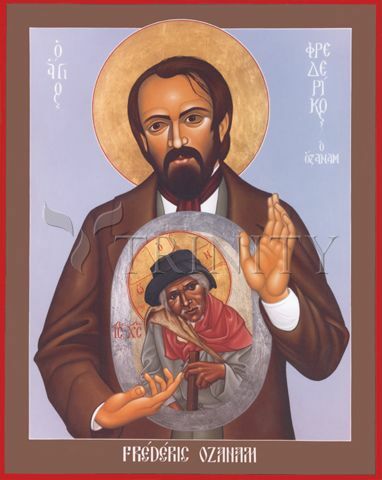 This icon of Blessed Frederic OZANAM is at the Vincentian Shrine in St Peter’s Church, Phibsborough, Dublin 7, Eire. Frederick then started a newspaper, The New Era, dedicated to securing justice for the poor and the working classes. Fellow Catholics were often unhappy with what Frederick wrote. Referring to the poor man as “the nation’s priest,” Frederick said that the hunger and sweat of the poor formed a sacrifice that could redeem the people’s humanity. On August 23, 1997, the day of Frederick’s beatification by John Paul II in Paris, the Saint Vincent de Paul Society included 875,000 members in 47,000 Conferences (teams) in 131 countries of five continents. Frederick’s motto always was “To become better – to do a little good.” Frederick integrated his professional life with his ministry so well. Frederick Ozanam remains a model example of a Christian life well-lived. His commitment to the relevancy of the Gospel in modern life continues to inspire. You made Blessed Frédéric Ozanam a witness of the Gospel, full of wonder at the mystery of the Church. We thank you Lord, for those many gifts and we ask, if it is your will, the grace of a miracle through the intercession of Blessed Frédéric Ozanam.